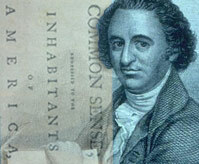 Most U.S. Americans will recall the title of the Revolutionary War tract written by Thomas Paine called “ Common Sense ”. What many do not remember is the content of this very important, very honest account of life as seen by one of our Great Patriots. “ Common Sense ” is no longer in the synopsis of most public school curricula these days, either; the reason is obvious. Thomas Paine was nothing less than a pseudo-anarchist, which all men of complete logic tend to become. As a document that helped define the belief system of a nation, it would behoove us to reexamine Paine’s writings, and reap rewards from its wisdom. This is succinct and true. Anarchy is the absence of government, not the absence of society. Anarchy does not mean chaos; tyranny is the harbinger of that fearsome foe. Paine admits that ‘society’ is the mutually agreed upon collectivization of humanity, and that government is designed to destroy such a harmonious society. As anarchy is the opposite of authority; so, too, is society opposite of government. Both can live on the same planet, but they will ever be at odds. Thomas Paine added history, psychology, and philosophy to his essay. Americans often say that the world would be lawless without government. They fear the “evil” in men, and therefore ask for security. Paine writes that if humanity obeyed its conscience, “man would need no lawgiver; but that not being the case, he finds it necessary to surrender up a part of his property to furnish means for protection of the rest.” Being as this is obviously one of man’s most primordial fears – thus the early institution of governments – governments themselves have utilized this fear. This is the basis for political dialectics, which the modern State has adopted wholeheartedly. Why does authority exist? Paine asks that question: “Male and females are the distinctions of nature, good and bad are the distinctions of heaven; but how a race of men came into the world so exalted above the rest, and distinguished like some new species, is worth inquiring into, and whether they are a means of happiness or misery to mankind.” The Illuminati! This is whom Paine speaks of. The Illuminati, loosely defined, are the top echelon of the hierarchical pyramid that has been implemented over all of civilization. It is most definitely worth asking how they were able to attain their place, and whether or not they have given humanity a net benefit or detriment. Paine: “The nearer any government approaches to a republic, the less business there is for a king.” This holds true. Although U.S. presidents have vast powers, they wield less in our republic than any monarchy that existed. Comparing the United States with Switzerland further proves this idea. Switzerland is a federal republic, and more so than the U.S. The Cantons of Switzerland have more power in relation to the federal government than the States of the U.S. have in the face of our gargantuan Fed. Also, a direct referendum is allowed for any law that passes, making the Swiss people a more democratic people, and giving them the ability to overturn any bill. The final result is that Switzerland has no president; rather it has a governing council whose head is changed annually. This is the path I would like to see America take. It is worth noting that the education and per capita wealth are much higher in Switzerland than in America. An argument against the Revolutionaries was that Britain was the mother country. That argument is made today. Many claim that the U.S. Government is our mother and father. I say, as did Paine, “Then the more shame on her conduct. Even brutes do not devour their young, nor savages make war upon their families…Europe is the mother of America, not England.” Today, I say that the World is the Mother of America, not the Federal Government. The U.S. Government is nothing but a complete fraud. But the wonderful melting pot that is America - that is real; we the people are real. The U.S. government devours their young, not leastways by excluding Thomas Paine in government schools. Paine asks the question as to whether or not America would be prosperous without England. “Our corn will fetch its price in any market in Europe, and our imports must be paid for, buy them where they will.” Once again, this holds true. Our work will fetch its price. The goods we manufacture will be bought, and their quality will rise in price, not decline. When the disadvantages are weighed, their weight is also the same today. Paine states that by withdrawing from the influence of Britain, we would no longer be embroiled in her bitter wars. If we were not involved in today’s government, we would have more peace. Our government staged the Gulf of Tonkin incident, starting the Vietnam conflict. In the Balkans, Americans were subjugated to the will of NATO, and used to kill Christians in their centuries-old fight against Muslims. The 9-11 incident was concocted and staged to embroil us in the current Iraq war. Without government, we would not be involved, and therefore animosity toward the Nation would lessen. Also, the Islamic terrorists have made it clear that their targets are Wall Street, Hollywood (because of propaganda-value), D.C. So, it is evident that they do not necessarily want to kill Americans, only Americans affiliated with the Corporate technocracy and their military/industrial complex which is our government. Paine writes, “To talk of friendship with those in whom our reason forbids us to have faith…is madness and folly.” One need only read the list of atrocities perpetrated by our own government to admit this is true today. Our government knows this, and that is why they are crafting a society based upon surveillance, prisons, fluctuating economies, and war. Thomas Paine ends “ Common Sense ” stating that all ties between England and America must be severed. In America, the time has come to sever ties with Washington, D.C. Unfortunately, the people are not ready. Americans have become docile. We sleep. There is no divine right of kings. But, there are natural rights of man. The kings are not natural, nor or they heavenly, as Paine admits. They were conspired into existence. Government, and the U.S. government, continues to this day not through God, and not through Mother Earth. It lives through conspiracy, and comes from Hell, if such a place exists.